Preheat the oven to 190°C, gas mark 5. Use some of the melted butter to grease 15 madeleine moulds. Measure 50ml of the remaining butter and set aside to cool (there may be a little butter left over, which you won't need). Whisk the egg and caster sugar until the mixture is very thick and mousse-like, and the beaters leave a clear trail. Sift the flour on to the egg mixture and fold gently in. Then fold in the orange zest and the cool melted butter. 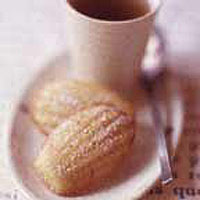 Fill each madeleine mould with the mixture and bake for 7-8 minutes. Turn out onto a cooling rack. Dust with icing sugar when cool, and serve.